Added New items on some Scroll!!! A gambler seal that attached to cheek for a lucky charm. An eyes protector made for researcher. Reduces damage taken from Demihuman monster by 3%. When receiving physical attack, has a chance to inflict Curse on the enemy. Reduces damage taken from Demihuman monster by 2%. Reduces damage taken from Demihuman monster by 1%. A stylish monocle that attached with dragonfly ornament. This monocle belong to a famous thief, Kaito. Adds a chance to auto cast Level 1 [Steal] when dealing physical attacks. Wearing dizziness imitation of giants Sirt of the flame that would burn the world, you can feel the heat to get angry. Increases resistance against Fire property attack by 8%. There is a way out of every dark mist, over a rainbow trail. - Robert Motherwell"
Increase damage to Demi-human by 3%. One of the holy weapon of Rudra, the God of storm. Increases long-range physical attacks by 3%. Stem of plant that has efficacy of neutralization. Restore HP by 30 and SP by 3 when killing enemy. This diadem has been worn by a heroic woman. The legend says she had supernatural powers. You can feel a strong magic flow when wearing it. Increases resistance against Neutral property attacks by 5%. Increases resistance against Dragon monsters by 5%. Has a chance of autocasting Level 8 Endure when receiving physical attacks. A proud sakkat of Indonesian independence fighter. Reduce damage from Demihuman monsters by 10%. A mask more by people whose worshiped Demon god in the past. Reduces damage taken from Demihuman monsters by 2%. Reduces damage taken from Fire, Water, Wind and Earth element attacks by 5%. And you can Upgrade it to RTC 2nd Winner hat on Mighty Hammer NPC! Reset Fruit - You can use it to reset the enchantment of your Costume Headgears. 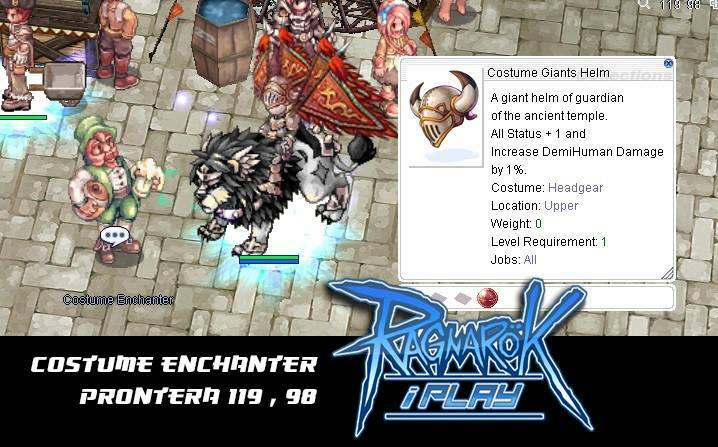 You may now Enchant your Costume Using Play Stone (Available at Usable Donate npc) for only 10 pcoins!! You have a 20% chance enchant upgrade with a random stone effect! Increase Attacking speed (Decrease Delay after attacking) by 4%. Increase Attacking speed (Decrease Delay after attacking) by 6%. Increase Attacking speed (Decrease Delay after attacking) by 8%. Increase Attacking speed (Decrease Delay after attacking) by 10%.